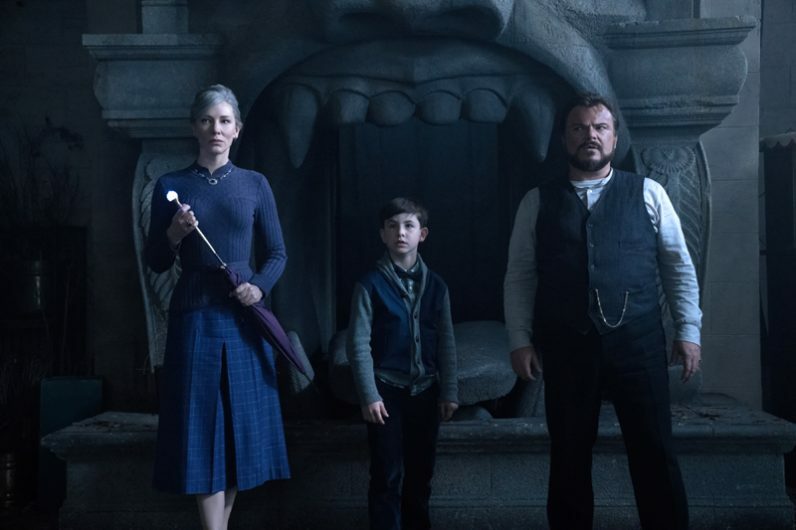 NEW YORK (CNS) — For all its spells and incantations, the witchcraft-themed fantasy “The House With a Clock in Its Walls” (Universal) lacks magic. Though some of the humor works, the film makes little impression and registers as only passable entertainment. Too scary for tots, director Eli Roth’s adaptation of the first in a series of books written by John Bellairs and illustrated by Edward Gorey is acceptable for most others. Parents, however, may not appreciate the quasi-profanities that occasionally and — given the target audience — needlessly crop up in Eric Kripke’s screenplay. After his parents are killed in an accident, 10-year-old Lewis Barnavelt (Owen Vaccaro) goes to live with his eccentric Uncle Jonathan (Jack Black), who turns out to be a warlock. Having mastered some of the rudiments of his new guardian’s craft, Lewis assists him and his best friend, nice witch Florence Zimmerman (Cate Blanchett), in trying to locate and stop the timepiece of the title. This doomsday device, with its capacity to turn the calendar back before the advent of humanity, was lodged in the Victorian pile Jonathan and his charge call home by its previous occupant, good-warlock-gone-bad Isaac Izard (Kyle MacLachlan). As flashbacks show, Isaac was traumatized by his service in World War II and turned to the dark side. The completion of his scheme requires someone to use black magic to revive the recently deceased Isaac, a part of the plot that may not sit well with Christian believers. And then there’s the seemingly inevitable potty humor characteristic of so many movies for kids. Since this mostly involves a not-yet housebroken topiary griffin that comes to life only to make a nuisance of himself, grownups may slough it off easily enough, though. Instead, for all the longstanding popularity of its source material — which dates back to the 1970s — the screen version feels routine. Its apprentice wizard, its gothic setting, its dustups between the characters will all likely strike viewers as derivative. That may be unfair to Bellairs since his work long preceded the Harry Potter juggernaut, for instance. But, unlike their villain, the folks behind “The House with a Clock in Its Walls” can’t reverse the onward march of chronology. The film contains occult themes, considerable peril, some scatological humor and a few mild oaths. The Catholic News Service classification is A-II — adults and adolescents. The Motion Picture Association of America rating is PG — parental guidance suggested. Some material may not be suitable for children.